Blackjack is one of the most popular games in both land-based and online casinos, and also the one that generates the most profits for the industry. This is particularly surprising given the fact that it carries a relatively low house edge compared to other casino games, but the explanation is rather straightforward. Casinos win due to volume of play and although they win small amounts of money during individual sessions, most players end up on the wrong side of profit on the long term. 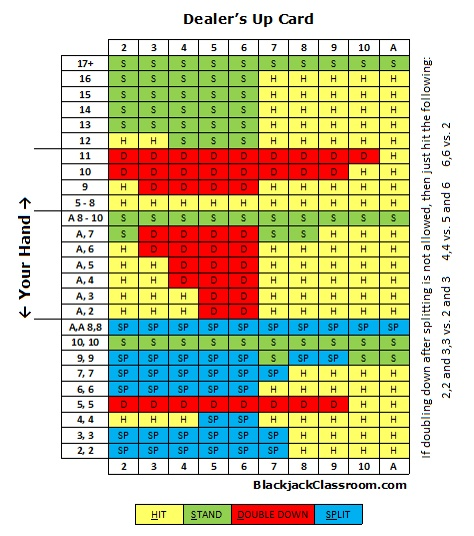 To offset the house edge and improve your chances to win it is paramount to get familiar with basic strategies for blackjack. All casino games demand a bankroll and only by setting one in advance, players can hope to avoid downswings and mitigate the risk of addiction. The bankroll is an amount destined exclusively for the game of blackjack and it shouldn’t be used for or fueled by money destined to cover daily expenses. Another argument in favor of having a sum of money reserved for your game of choice, is that this allows you to play in bankroll and properly choose the blackjack tables and stakes. Regardless of what blackjack strategy players rely on, it can only be employed successfully if they have a deep enough stack. When choosing a table, players should focus on those where the maximum bet doesn’t exceed 5% of their bankroll, with more precautious players recommending a stake of 3%. Progressive blackjack strategies such as the martingale demand players to double the stakes after each losing round so they represent the exception to the rule. In this case, players begin by wagering a single unit and their bankroll should be at least 128 times larger, to support seven consecutive betting rounds. The rule of the game states that the player who comes closer to 21 is the winner, but players tends to overplay their cards in an attempt of coming as close as it gets. The rule of thumb states that players should stay at 17, but it is worth hitting soft 18 if the dealer got a 10. Splitting eights and aces is a good idea, but doing the same with nines, tens and face cards is a mistake, because it is better to secure smaller profits than to chase elusive higher ones. Regardless of the stakes you are playing at and no matter how large your bankroll might be, stay away from insurance. It has terrible odds and on the long term you end up losing more money than by conceding the hand on those rare occasions when the dealer has a natural blackjack. Pay attention to what the dealer is holding and keep drawing cards until you get at 17 if the dealer has a seven, while standing at lower values if the dealer has a card ranging from 4 to 6. Make sure that the odds of winning in blackjack are always in your favor, by learning the basic strategy with the table and sticking to the rules.